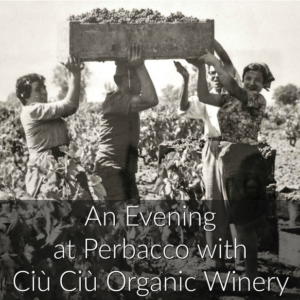 On Thursday, July 20 we are excited to host an evening with Ciù Ciù Organic Winery. Long time cellar master Paolo Agostinelli will be on hand to talk to guests and pour their wonderful wines. That evening Chef Staffan will prepare three dishes that are indigenous of the area alongside our full dinner menu. To make reservations to join us, please call Perbacco at 415-955-0663. The winery’s commitment and tradition, along with the conviction that wine should be the most authentic expression of the land, provide the basis of a vast range of wines: from the Passerina and Pecorino grape varieties indigenous to the Marche region – rediscovered thanks to the efforts of just a small number of winemakers – to the more well-known Montepulciano, Sangiovese, Merlot, Cabernet, Barbera, Pinot and Chardonnay. Ciù Ciù wines are the authentic expression of the company’s commitment and tradition, the result of research and quality in both the vineyard and in the cellar, but also of a natural wine-growing ecosystem of quality with a “terroir” (microclimate, soil and subsoil) that is unique. The Ciù Ciù Organic winery is located in the heart of the Piceno hills, at Offida (Ascoli Piceno), in the Rosso Piceno Superiore production area and its vineyards extend over an area of 150 hectares. In the farm, even if it is a family run business, works a technical group which aim is to restore the wine and oenology inheritance of the wines of Region Marche. The scrupulous care and growing systems of the vineyards, have brought the wines Ciù Ciù to quality range that made them famous in the national and international market.